EwingCole, an award-winning architecture and engineering firm based in Philadelphia, has designed a $60,000,000 renovation to The Pavilion, home of the 2016 NCAA men's basketball champion Villanova Wildcats. EwingCole's renderings of the new facility were revealed on March 8, at a ceremony held in conjunction with the Big East Basketball Tournament in New York City. The renovated Pavilion is expected to begin in June 2017 and be completed for the start of the 2018-19 basketball season. "It was important to Villanova that we celebrate the uniqueness of The Pavilion while creating an unmatched Division I basketball experience for the players and the fans," said Bill McCullough, AIA, principal of EwingCole's sports practice. "We worked closely with administrators, coaches, staff, and alumni to create a project that reimagines the arena into a world-class, basketball-centric facility all about fan experience." Upgrades to the two-story, 6,500-seat structure include a relocated main entrance, a completed concourse, and increased quality of premium offerings, seating, and amenities. 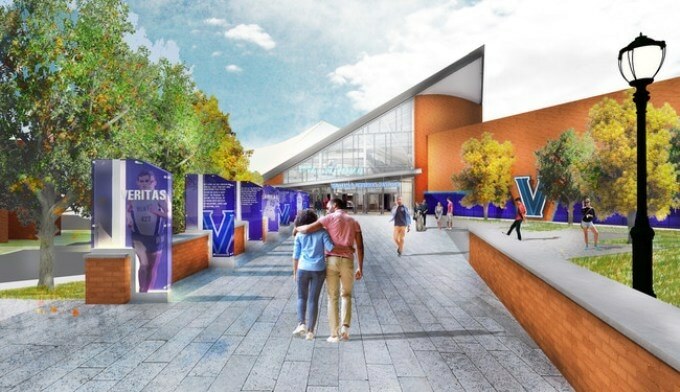 These modernizations will not only support Villanova's men's and women's basketball programs but other University-wide events and programs. According to McCullough, Villanova targeted several specific items for improvement. "Ultimately our goal was to significantly enhance fan experience, player and performer experience, and operational efficiency within the Pavilion." The design of The Pavilion includes relocating the main entrance. This new entry sequence, at the southwest corner of the building, will allow the majority of patrons to enter the building closer to where they arrive and take advantage of the large area south of the main arena. "A great experience begins as soon as the fan has left their primary mode of transportation," said Kevin Murphy, RA, architect at EwingCole. "This project aims to improve the approach to the building by including an outdoor plaza for pre- and postgame activities, augmented by improved landscaping, site lighting, and site furniture." Originally opened in 1986, The Pavilion, when complete, will be known as the Finneran Pavilion, in honor of Villanova alumnus William B. Finneran, and will be unsurpassed as one of the most fan-friendly, high technology arenas in the nation.